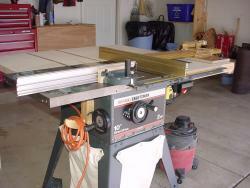 My trusty old Craftsman tablesaw seems to have less and less Sears components in it as the years go by. I replaced the blade with a Forrest Woodworker II. 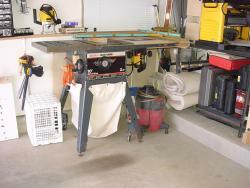 The right wing got replaced by a custom made router table. The piece-of-junk fence got replaced with an Incra router fence that also doubles as tablesaw fence. I wired a couple of 4-outlet boxes onto the side of the thing to power a variety of tools. I added a dust collection bag. 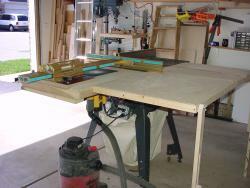 Most recently, I built a folding outfeed table that attaches to the back of the saw.